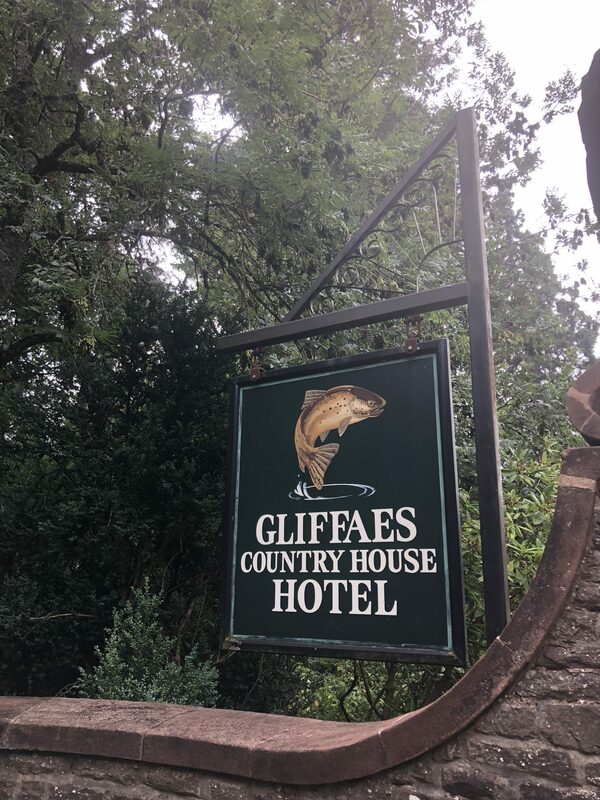 Nestled in the heart of the Brecon Beacons, Wales you will find Gliffaes Country House Hotel. This is a family run hotel of three generations. This would be my first time in Wales, Adam was returning having done a number of mountain races in Snowdonia, North Wales and having played rugby in Swansea many years ago as a teenager. With a 305 mile journey from the North East we arrived in Crickhowell, 5 hours 30 minutes later. The Brecon Beacons reminded me very much of the Lake District with its beautiful scenery, mountains and rivers. We approached the grounds of the hotel through the main gate, flanked by a beautiful gatehouse. The single track driveway was lined with trees and you could tell that the grounds were maintained with a great degree of love and care. On arrival, we parked the car and went to check in. We were greeted by Penny, who kindly welcomed us with a small tour of the facilities. My initial impression was that you could feel the warmth of an authentic country home with an understated elegance. I could tell this was going to be a great place to stay. We completed the check in with Penny asking us whether we required a morning paper, the option of a turn down service and reserving us a table for dinner, all were nice touches I thought. Room 6 was ours for the night and as soon as we entered it definitely had the WOW factor, for its space and setting. A gentle breeze guided us to the opened double doors, which led to the balcony overlooking the valley and the River Usk. I could have sat there all day, there is something about the sounds of nature and and flowing water which relaxes you instantaneously. Our bedroom was beautiful, with a king sized bed being the centrepiece, a fireplace, dressing table and sitting area with a tv. All in keeping with the country house. The bathroom was stunning, with a free standing roll top bath overlooking the gardens, I was in my element. Toiletries which were locally sourced were offered in large containers, with a nod towards the environment and less wastage. We also had a walk in cupboard to store our belongings and hang up our clothing, there was also an iron, ironing board and hairdryer available to use. 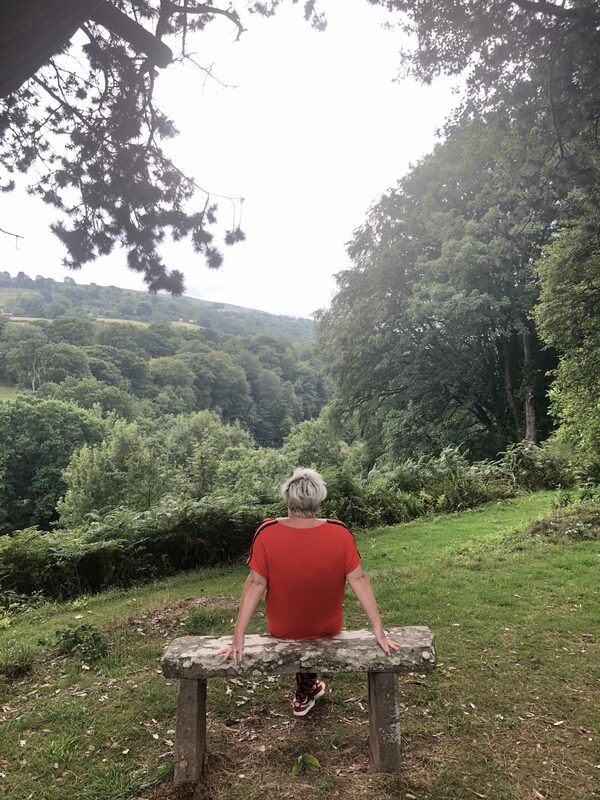 We decided to take a walk and were advised about the hotels ‘tree walk’, with a love for nature and travel the family have developed these gardens, there is over 600 years of habitation. With trees from around the world guiding you around the walk, it was both enjoyable and photogenic. Interestingly it is listed as a ‘notable tree collection’ in the tree register. We returned to enjoy afternoon drinks on the terrace, where many other guests were sampling the afternoon tea. After dressing for dinner, we had an aperitif in the bar area, whilst we browsed the menu. There was plenty choice and my mouth watered reading them. We ordered and once our food was ready we were shown through to the dining room, which was perfectly set. To start I ordered the Crab and Welsh Ale Tartlet and Adam had the Trio of Salmon, Main course I opted for the Welsh Sirloin Steak and Adam the Tournedos of Chicken. Finishing with Warm Chocolate Fondant and Adam the Selection of Welsh Cheeses and Biscuits. We accompanied our meal with a bottle of Rose from the extensive wine list. 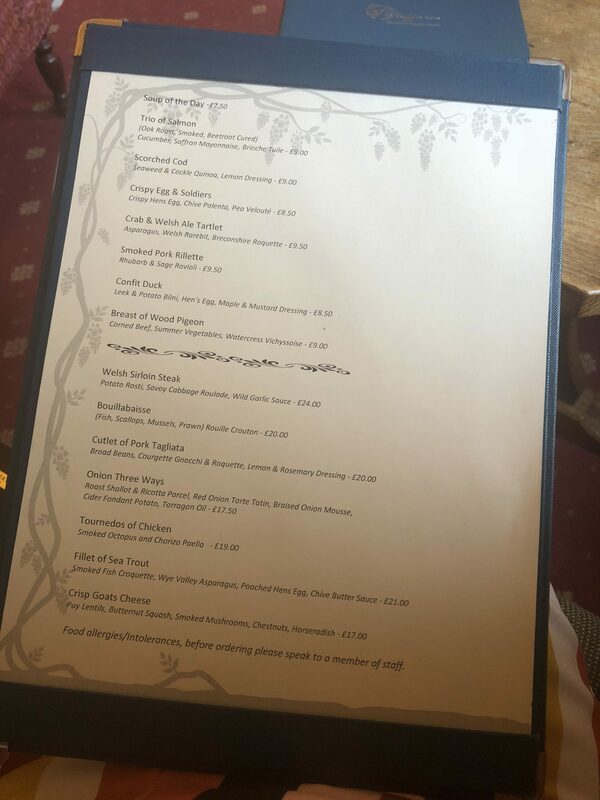 Our evening was unforgettable due to the delicious food, that was so well presented, the excellent service and homely atmosphere. Faultless would be the word I would use. We decided to have a drink before bed back in the bar and had a great conversation with the bar man about our travels around the world. Well rested we woke up to the tweeting of birds and got dressed for breakfast. Our morning paper was there to greet us, we went into the dining room and enjoyed a tasty feast, firstly there was a buffet set out of fresh fruits, juices, cereals and warmed croissants to entice us and a menu to order cooked items. We both had the traditional breakfast, with Welsh bacon included and toast to order. Stuffed we went up to our room to pack up and head into Crickhowell to explore, then onto Cardiff. Gliffaes can only be described as a true country house. The staff and the high level of service they offer seems so effortless and there is a very genuine feel without having to over try. I wouldn’t hesitate for a second in recommending this property to all and it was well worth the long drive from Newcastle. As Adam and I have been telling people for the last week since returning. This was a complimentary stay, however these are my own and honest views.